You know how department stores start taking out Christmas decorations before Halloween even comes around? And all you're thinking is - "WHY?! Why are they taking this stuff out this early?!" 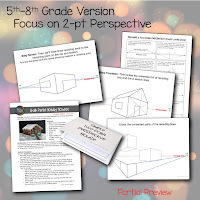 This lesson was designed with two distinct paths in mind - a version for younger students (2nd-4th grade), and a more challenging version for older students (5th grade+). 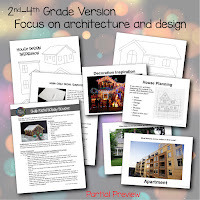 Simplified Version (2nd-4th): Students will learn about what an architect does and then talk about what features are necessary for a home (after comparing and contrasting a number of homes - house, apartment, igloo, houseboat, etc.). 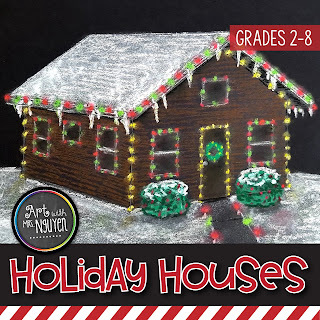 Afterwards students will create their own house drawing (or if you're short on time - can use one of the 6 house templates included) and then decorate them using chalk and oil pastels! 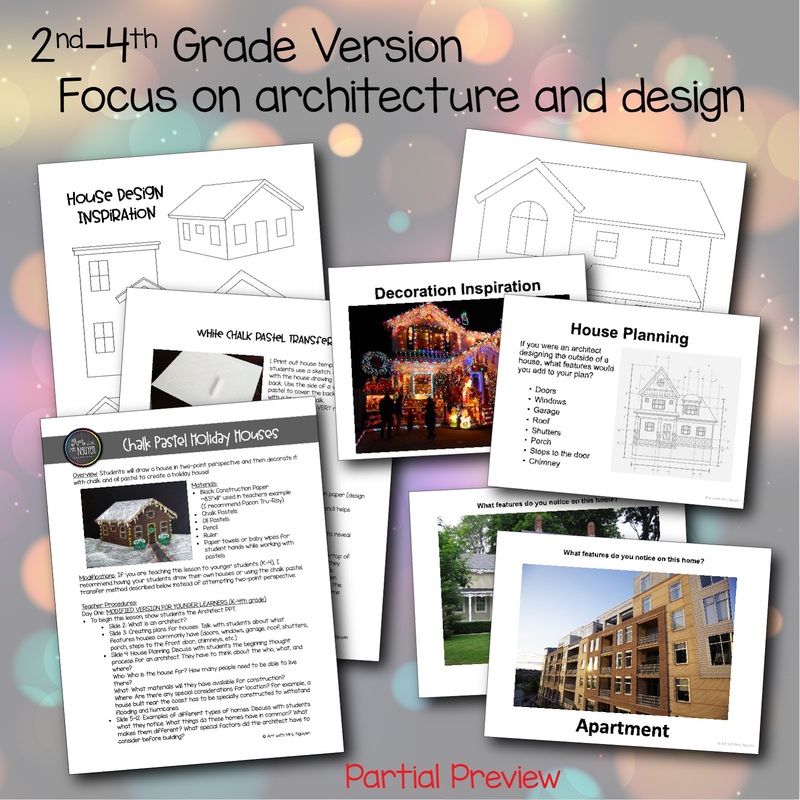 Advanced Version (5th-8th): The advanced version of this lesson focuses on drawing in two-point perspective. 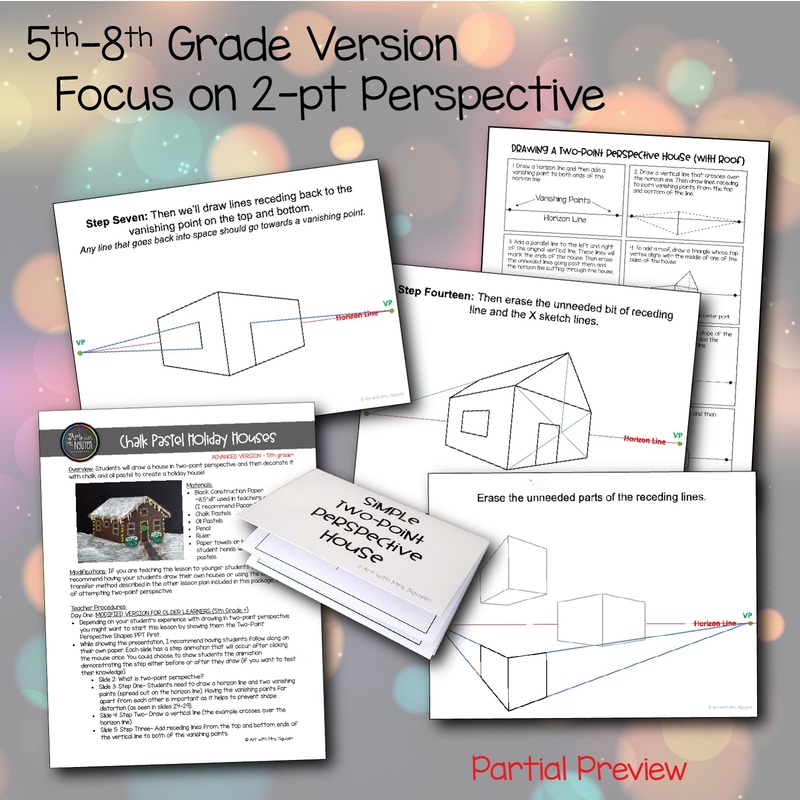 First students will learn about drawing forms in two-point perspective in a variety of position (above, on, and below the horizon line). 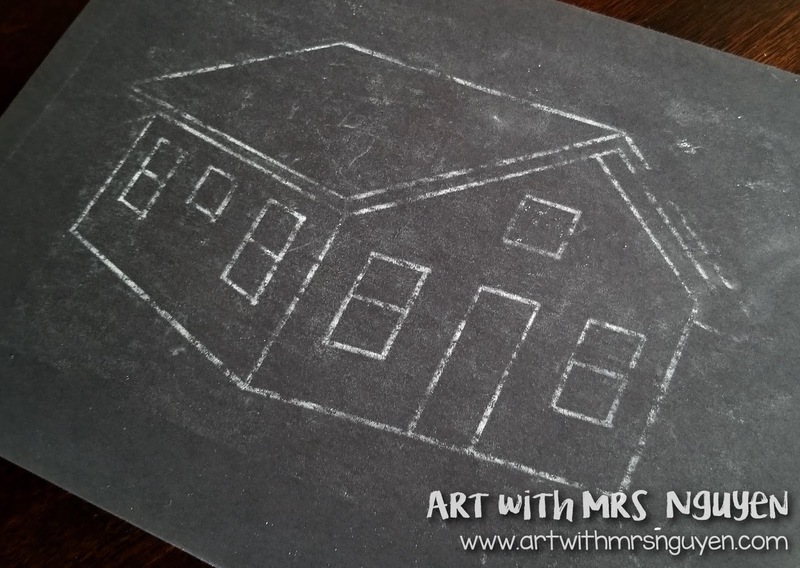 They'll also learn about how the positioning of vanishing points can distort and alter the look of a form.Then they'll learn how to draw a house in two-point perspective. 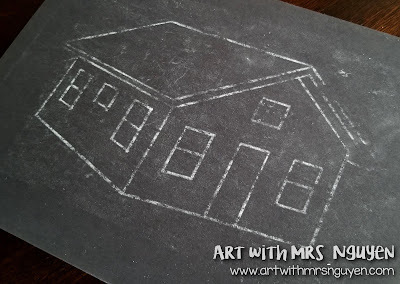 Once both groups have their house sketched out, they'll either redraw it onto a piece of black construction paper or transfer it (a white chalk transfer works really well for this). Then the decorating begins! 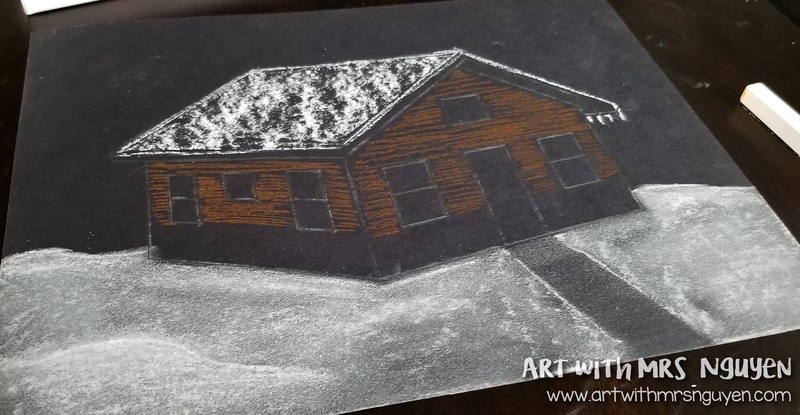 I personally prefer starting by adding the snow with the white chalk pastel (if it's added later after other colors, it's more likely to get dirty). 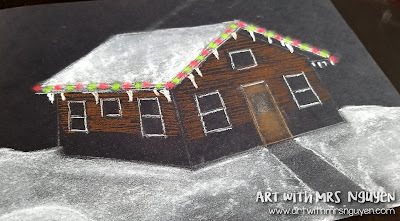 Then work on adding base color for the house with chalk pastels (leaving blank areas for other things if you know you're going to add them later - like bushes, plants, etc.). 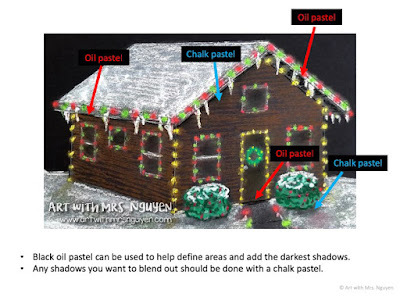 To get the look of glowing lights on the house, have students color little circles where they'd like the lights to be with chalk pastels, then move their finger around in a circle on top of the chalk to blend it outward. If the light gets too blended out, they can always add more on top. While most of the color in this project is added with chalk pastel.. there are some areas where oil pastel works more effectively (like any place where you need more contrast or really well-defined lines). My favorite part of this lesson is how it combines learning important art concepts with winter-themed fun. You don't have to pick one or the other with this one! If you're interested in purchasing the entire lesson, please check out my shop!